Home > Local News > How slow does your car go? How slow does your car go? 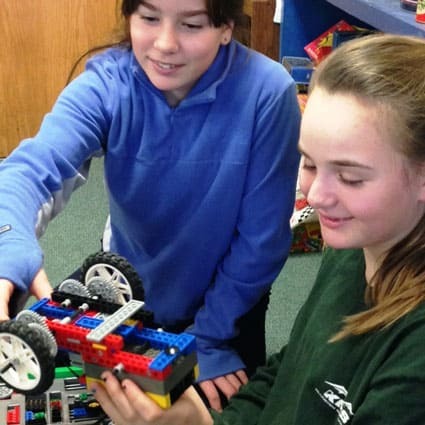 KILLINGTON—”How slow does your car go?” asked students in Amy Simonds’ sixth grade class at Killington Elementary School as they worked in teams to build and program Lego® cars that use gears to travel as slowly as possible. The culminating activity was a “snail race” competition to see which car moved at the slowest rate. Simple machines, mechanical advantage, and engineering were the focal points of this lesson. After practicing with Lego® pieces to build such things as levers, gear trains, and pulleys, students worked in teams to begin the process of building their slow cars. Each student quickly realized the benefits of working as a team and the need to pool knowledge of engineering practices and gear ratios in order to design a very powerful, but very slow, car. This Lego® unit aligns with the Next Generation Science Standards, incorporating engineering, teamwork, creativity, and fun into the tasks.